Michael Perry ofm (Minister General), Gregory Redoblado ofm (Definitor General) and Mike Johnson ofm (Visitator General) visited the friars at St Paschal Friary on Thursday 25 February to Saturday 27 February. 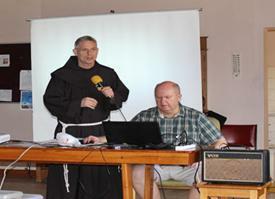 The gathering included the Slovenian community of friars. There was some time for the Minister General to talk with the friars about fraternity and ministry in Australia. Recreation was enjoyed by the friars and their visitors on Friday evening. Greetings from the JPIC office Rome! 18 June 2016 is the first anniversary of the encyclical, Laudato Si’. The encyclical pointed out the ecological crisis of our times and strongly suggested that we listen to the cries of the poor and our Mother Earth and response to it. When the encyclical was released believers as well as non-believers acclaimed it and the local churches worked hard to adapt and integrate it into their lifestyle. Keeping that in mind, we would like to remind the friars of a coming global event. June 5 is World Environment Day. It is the United Nations’ most important day for encouraging worldwide awareness and action for the protection of our environment. “Every World Environment Day (WED) is organized around a theme that reflects a pressing environmental concern. The theme for WED 2016 is the illegal trade in wildlife under the slogan ‘Go Wild for Life’, which threatens species such as rhinos and tigers with extinction. 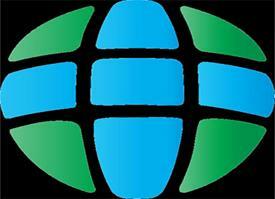 Below are the links for UN World Environmental Day. They are available in many languages. As Friars Minor, we invite you to pray and act in solidarity with the ecologically poor and Mother Earth on this occasion. St Anthony came to join the Franciscans in 1221 at 26 years of age, inspired by the death of five Franciscan martyrs in North Africa. His gift to the church was his extraordinary preaching. 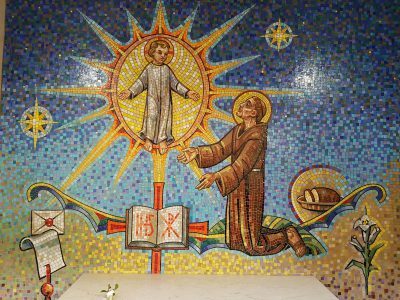 In Franciscan churches, St Anthony’s Day is celebrated as a solemnity. The friars remeber the kidness and concern shown to them in so many ways including friendships, practical generoisuty and prayers. The annual mass in honour of St Anthony was held at Mary Immaculate Church (Waverley, NSW) on Monday 13 June at 10am. There was the customary blessing of lillies and distribution of blessed bread for the poor. 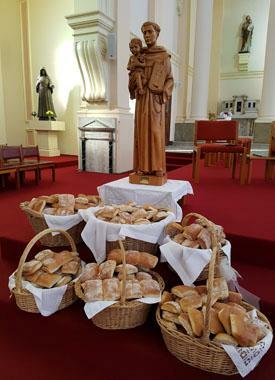 This year, the bread was provided by The Bread & Butter Project, a not-for-profit social enterprise which provides training for refugees as bakers, and a project the Franciscans are proud to be associated as founding and ongoing sponsors. At St Therese Parish, Three KIngs on Tuesday 14th June took part in the Global Catholic Climate Movement’s celebration of the anniversary of Laudato Si’. Friar Thobias Harman talked about his work as part of the Eco-Pastoral team in Flores, Indonesia. The Eco-Pastoral project helps farmers improve on their traditional farming practices avoiding the cost and damage of commercial fertilizers. Over 500 farmers are part of the Eco-Pastoral project and they come together to share their farming practices with each other. The Eco-Pastoral project also encourages the planting of herbal gardens near to their homes to provide ready-access to nutritional food and traditional medicines. School children are given an education in agricultural methods, a subject not covered in the local syllabus, and they are involved in tree planting to protect local water sources and prevent erosion. The Eco-Pastoral team take the Gospel to the farmers in the fields and celebrates liturgies of thanksgiving and hope at times of planting and harvest. Friar Joe McKay talked about Pope Francis’ fundamental points in Laudato Si’. The encyclical repeats previous Catholic Social teaching about the need for the dignity of human beings to be upheld. Pope Francis questions how the current “techno-economic paradigm” through which we see the world has created a blindness that has allowed a throw-away culture to develop. We not only throw away things but across the world there is a tendency to throw-away people, especially the poor, indigenous communities and the unborn. Pope Francis is encouraging us to have dialogue between the various ways we see the world so that we ca see more clearly God’s work and our authentic place in it. That includes the contribution of Christian theology and contemplative prayer and fast disappearing indigenous cultures. Pope Francis states that it is the same fundamental cause, the lack of love, that creates poverty and damages the environment. Pope Francis asks us to adopt an attitude of graciousness and undergo an “ecological conversion” as a way of expressing our love for God and his creation. 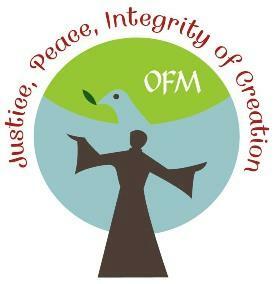 The Global Catholic Climate Movement was founded by the Franciscan Action Network in the USA. It is supported by Catholic Earthcare Australia, Caritas in Australia & Aotearoa and many Franciscan Provinces across the world. The GCCM website has some good resources on practical application of Laudato Si’ for parishes and communities.